Hungry Cravings: Happy 4th of July! I interrupt my European travelogue to wish you a happy 4th of July and share with you my Strawberry Shortcake recipe. Strawberries are in season, so shortcake is just the thing to serve right now. For a red, white, and blue dessert, toss in a few blueberries or blackberries. Have a happy and fun-filled Independence Day everybody! Preheat the oven to 425˚F. Whisk together the flour, sugar, baking powder, and salt in a large bowl. Add the butter and, using a pastry cutter, cut the butter into the flour until the mixture resembles coarse crumbs. Blend together the egg and ½ cup of the cream in a small bowl, add to the flour mixture, and stir until just combined. Transfer to a work surface and knead a few times until the dough just holds together. Pat the dough into a 6-inch wide, 1 ½-inch thick circle and cut into 8 wedges. Arrange the shortcakes a couple of inches apart on a parchment-lined baking tray. Lightly brush the shortcakes with the remaining 1 tablespoon of cream and sprinkle with the Turbinado sugar. Bake for 13 to 15 minutes, or until golden brown. Let cool to room temperature. Toss together the strawberries and sugar in a medium bowl and let macerate, stirring occasionally, for 15 to 20 minutes, or until soft and juicy. Whip the cream to medium peaks. Add the powdered sugar and vanilla and continue to whip to stiff peaks. Split the shortcakes in half horizontally and arrange the bottom of each one split side up on an individual plate. Divide the sugared strawberries and then the whipped cream among them. Replace the top half of each shortcake and serve immediately. Serves 8. 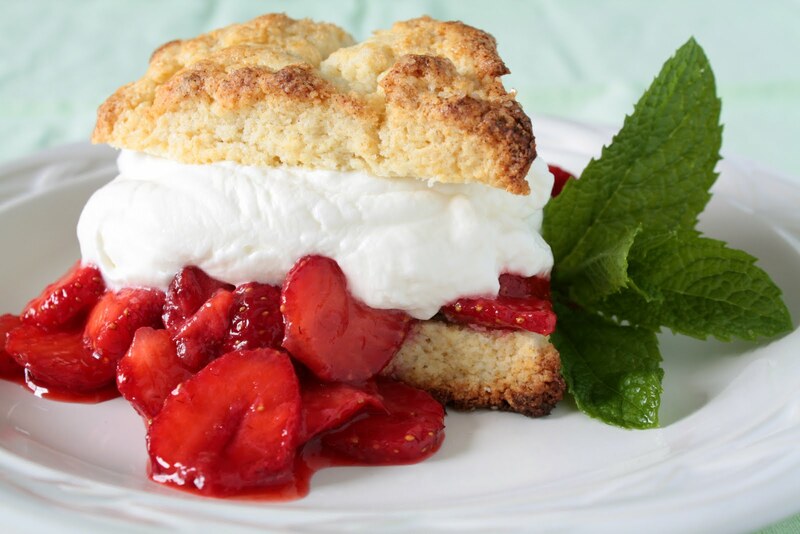 Here's my secret to the most irresistible version ever of this favorite summer dessert: I use my basic scone recipe instead of a bland biscuit as the shortcake base, and I don't skimp on the strawberries and whipped cream. The scone "shortcakes" are wonderful made with vanilla sugar. Work quickly and with a light touch to prevent the butter in the pastry from melting. Strawberries that aren't perfectly ripe will require additional sugar, so add more to taste. If you can get your hands on it, use Tahitian vanilla, which has a uniquely floral character, for the whipped cream. You'll need about 3 pints of strawberries for this recipe. Now decided ... strawberry shortcake is on my dessert menu for the fourth. How can you go wrong?